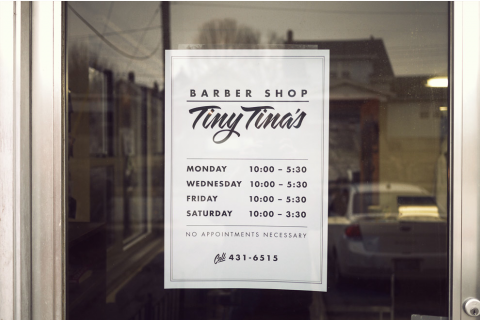 This Barber Shop Sign post is a prime example of just how awesome (and talented) my friend Chris Glass is. 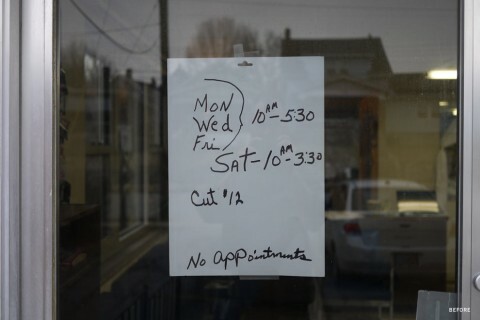 Chris needed a haircut and his barber needed a new sign in the window. So, he designed one. Check it out on his site for rollover before/after effect. Fellow designers, let’s follow Chris’ lead and make the world a more beautiful – typographically speaking – space! What sign are you taking on? Nice. And he got a free haircut? Fantastic idea. My hairdresser actually has an interesting sign, typographically speaking, but it’s all serif kerned so tightly it screams for air… i may just think of approaching them for a deal! It looks great, but would also look nice in cut vinyl applied directly to window. Just a thought. Kevin’s vision of Design Vigilantism is coming true! I’m usually just too worried that I will offend someone if I offer my design knowledge. Anyone know how to offer that assistance without sounding mean? I love the idea of designing to help someone … but what happens when he wants to change the times, does the design get another free haircut? Designing for free/charity is a tricky thing … but the heart is in the right place, good story. the Beautiful Losers documentary has a great bit about the signage the artists created for the Coney Island vendors… Steve Powers (ESPO) said that painting the Cyclone was one of the best things he ever did. I did indeed get a free haircut! When I brought in the signs I had a nice chat with Tiny Tina about how often she changes hours (Never was her answer). I was concerned about changes. We’re thinking about ways to incorporate a combination of applications to make a more finished and flexible solution. I just wanted to start chatting with her about it. Built a quick little one page site as a surprise to boot. Just something to get pertinent information out there on the web. Thanks for the kind words and (other) feedback everyone. A few years back I frequented a deli near my office in San Rafael, California. Their food was delicious food, but their menu was disgusting. At to a brand and communications strategist. I asked what made their food different. “Everything’s fresh” the owner said. I asked for a to go menu. A week later I came back with a new menu cleanly delineating their offering: FRESH sandwiches. FRESH smoothies. FRESH coffee. Although I did it for fun, they served me free lunch for a month. I like the before better. Folk typography ftw. The times are incorrectly aligned. Just sayin’. Good example for my students, what graphic design is. Great fonts! Looks so fresh and stylish. I’ve really really been meaning to do this with one of my favourite little restaurants. But where do I draw the line between act of kindness and working for free? Can anyone with more experience doing this suggest when a job moves from “quick freebee” to “payment required”? I’ve done this for a local pub because the owner was very nice and it was an unsaid discourse that I’d get a free pint out of it. I guess it’s that unsaid “barter” that keeps it from being too much of a freebie. I wouldn’t be the next Robin Hood of the Design Downtrodden however, since you have to really get to know the person you’re doing this for and not only have your time taken advantage of but cheapen the industry by giving it away for free. While there was no money changing hands for this simple yet effective design, it was paid for by an exchange of services, both of which have a dollar value. It was decided that the time and skill to design the sign = the time and skill to cut one head of hair. This is an extremely common transaction in the world of freelance graphic design. It’s not really a “quick freebee” (Marc). If payment is required, both parties would have agreed to this beforehand as the terms of the design (or haircut) contract. Boy, I hate to be a meanie but I see a big fail. The most important element of the original sign — the selling point — a fantastic price, has been eliminated. What does it say about our field when we fail to recognize the difference between “making it pretty” and “helping to make a sale”? I like looking at pretty things, I do. But one of the greatest disservices we (designers) do to our profession is to focus so exclusively on it. I prefer the former over the later to be honest. There is something unique, indelible, honest and personal about it. I design stuff all day – so when I am out I love seeing the un-sanitized, charming communiques of individuals, untouched by brand or corporate guideline. I should really watch my language. You’re right that “no money” doesn’t really mean “free” and sometimes an exchange of services is a great opportunity for everyone involved. I would think it would be great for networking as well, leading to more billable projects. 1. I made a sign for a barber I’ve been going to for almost 15 years. 3. I loved making it. 4. We talked about what could make it better. 5. Then we hugged. Seriously. Bartering is such an amazing, yet under-utilized system. I just had a prob with my car that would’ve been hundreds of dollars in labor, maybe even a thousand. With how old my car is, it would’ve been the end of my baby. Instead, I paid for parts and traded in labor. Not only am I back on the road, but I get to do freelance work for a great client. Back in my student days, I used to do small translation jobs for restaurants in exchange for meals. Great learning experience! Am I the only one that likes the original better? Looks nice, but the original is actually quicker to scan – chunked better, easier to take in and understand times at a glance. Also, I must agree with the commenter who misses the price. I’m very sad the $12 didn’t make it onto the redesigned piece. I’m not saying she should have kept the original, but I think more of what actually (probably unintentionally) worked about it could have been kept. wonderful! there needs to be a larger call to action to make the world more typographically beautiful. I’m sorry, the original is a virtually unreadable mess. How anyone could actually want that to stay is beyond me. People don’t know Chris and his general awesomeness and positive, giving nature. This wasn’t an attempt by him to showboat or be an attention whore. It’s him doing something he loves for someone he likes. And Chris knows his $#*t when it comes to graphic design. It’s a shame people had to $#*t on something that came from such a good place. Sorry Chris, no good deed goes unpunished. I love it. What a heart-felt, generous way to use your talents, so that she can use hers as well. I like that you saw a way you could help and you did it. AND you did it in a way that she can even increase (or decrease) her prices if she ever wanted to….you know, if Libya can’t get their crap together anytime soon and she needs to drive to the elderly. I’m sure everyone in town knows how much a cut is anyway. This is middle America. I’m proud of you, Chris. Nice job, as always Chris. A solid piece of design work like this makes a small owner-operated business look a little more classy and professional in a simple, straight forward way. The fact you did this for a friend must make it even nicer. SM: defending a friend is to be applauded, but saying my comment is “nothing short of brutal” is clearly overdramatic. In my experience “FAIL” is often used in a humorous context. At times a bit snarky, but rarely mean. If anything, I expected to be questioned for taking a bit too harsh a critical eye to what was obviously a nice gesture. Please accept my apology for appearing impolite; but having said that, I stand by my comment. We don’t know all the details. We weren’t there. Maybe Tiny Tina doesn’t always offer $12 haircuts. I think this is a minor detail. What’s important? The sign is a nice gesture, one person doing something nice for someone they care about. It’s something we can all do and the nice surprise is getting something in return when it’s not expected. Way to go Chris! I love your poster and the thought that went with it. Nice work Chris—makes me want to ‘do a good deed’ today. Also makes me realize, based on the comments, that we as designers need to see a project for what it is. We do more meaningful work when we can step away from all of the awards and advertising jargon and just do something nice for once. @haters: give this guy a break. I don’t think Swiss Miss posted the sign because it’s going to take away a One Club pencil. This sign deserves some life recognition — which is better than a shelf ornament.